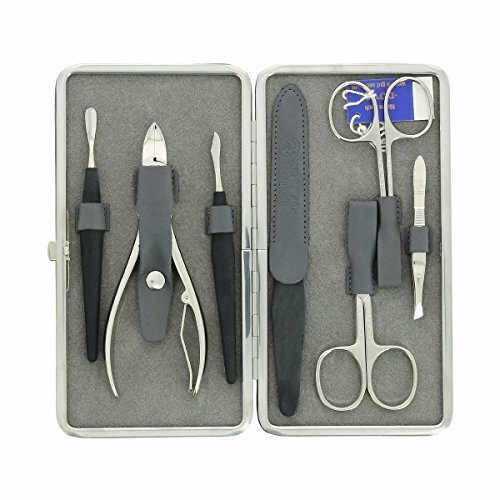 This Dovo 7 piece deluxe carbon steel manicure set is hand made in Solingen Germany to the highest standards. Each tool is precisely crafted and sharpened to perfection. All tools are made from high quality carbon steel with a nickel coating. The set includes: Slant tips tweezers, Cuticle scissors - 3 ½", Curved Nail scissors - 3 ½ ", Sapphire nail file, Nail nippers - 5", Cuticle tool, Cuticle pusher, These precise tools come in a lightly textured red Cowhide leather hinged case, which opens by push button. If you have any questions about this product by Dovo, contact us by completing and submitting the form below. If you are looking for a specif part number, please include it with your message.